Nevermet Press is a website resource bursting at its seams with superb content you can drop into your existing campaign or inspire your next. It's not just the written word either. For those (like me) who can't stand to read a page of text without some eye candy - there is original art. None of the content is system specific and you would need a mind like granite for it not to blister with ideas. Having ideas is what you do, after all, you're a roleplayer. Scoff ye not, PDF snobs! Great content is just that, regardless how its served. Nevermet Press's format is ideal for those browsing for inspiration or short on time. 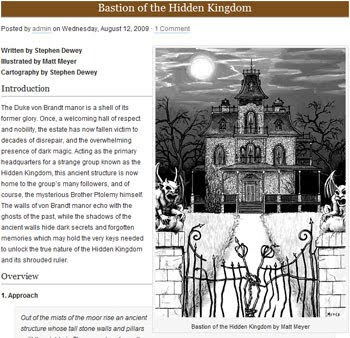 Beyond content, the site has a Forum (which is quiet but does give you a visible opportunity for feedback), RSS feed, Twitter updates, search and a taxonomy system. All you might hope for. I've been sitting on this for a while, waiting for the right time when there was enough content to review. There is now. Distributed Workshops - where the generic content is given popular system specific statistics to make it even easier to use in your favourite system. Quality often suffers with quantity but not so here. Nevermet Press has a band of merry contributors, who all each give a little every so often. This keeps the quality brimming too. Especially with the artwork, which is ceaselessly beautiful. All the content is system independent but not in a mind bendingly annoying way but in a delightful, tip-toe-through-tulips way. Many of the villains only need a sprinkling of statistics and skills to drop into your favourite game system. 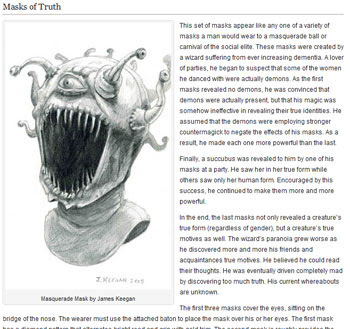 In my next campaign, I'm going to use one as a template but I can't say any more as the congealed evil filth that disguise themselves as players have rumbled me an keep an eye on this otherwise untainted blog. Being a chalky skinned Englishman places me ideally for using the word 'Props'. Not the spinning-death-blades on the front of a piston aeroplane but proper respect. I'm so street, I'm paved. I normally name authors, place them on a plinth and built an altar in the shed but in this community project, it isn't possible. There are just too many. Instead, let my creepy praise be aimed at the Founders: Michael Brewer and Jonathan Jacobs. Michael you may know from the 2009 Ennie Nominated Mad Brew Labs. A superb blog. Jonathan wrote The Core Mechanic, which started around the same time as this blog and was always a rocking read. It is some consolation that Nevermet Press was born from its ashes. 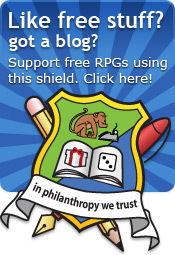 He also was a fevered brain behind the Open Game Table an Anthology of the best RPG blogs. Respect to both of you. For this section, I am going to remove my flamboyant crimson felt RPG blogger hat and affix my rather severe web designer top hat. All of my comments are based on using the website as a tool for finding something in a full tilt rush. On the front page I would like the categories front and centre. The tag cloud is good for tags but if I need to find an NPC in a hurry, I want to be able to click to go to a list. I would prefer lists of entries to have just a snippet, with a "read more" link. At the top of each entry, I would like a precis in two lines regarding what the entry is about. I would also like to see a PDF compendium in the future. In theory, Nevermet Press feels like a RPG project built on Bondai Beach. Michael and Jonathan have bested all RPG community statistics and created a superb content driven site with entries that can actually be used. Nevermet Press is a triumph. Picture Credits: Masks of Truth by James Keegan, Hidden Kingdom house by Matt Meyer. Whoot! Thanks for the kind word Rob! I couldn't read past "Gadzooks". My eyes has welled up as i buckled up laughing! The secret of monkey island reference? too much time on your amiga back in the day rob? @jonathan The thanks should lie with you. Bravo and keep up the good job! @misterecho, I was provided on this planet purely for your entertainment. It's quite simply, quite good. Great work Jonathan, Michael, and Rob! @Tenkar. I only do laying it on thick. If something doesn't excite me, I don't review it. ;-) If you think this is a bit too flowering, trying reading my Review of Icar. @Fitz Glad you enjoyed it! Are you planning a similar community site of your own? An extension of the blog may be? Awesome! Thanks for the review and I'm glad to hear the Kindle is getting some NMP action. Time to put our noses back to the grindstone and craft some more content! You keep putting up great content and I'll keep reading it!